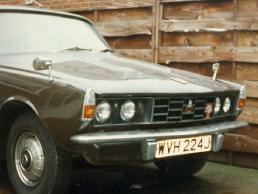 My Rover 2000 Auto, it has 46K on the clock. I had it given in 1992, after a week of small welding repairs I put it on the road and ran it for 3 years. I then decided it should have a full overhaul and I took it off the road for 2 years. I stripped it to the base unit, repaired the sills and floor properly, thoroughly waxoiled it and rebuilt it. I took the opportunity to fit central locking and an imobiliser. I always found the steering heavy on this vehicle and after checking everything decided to fit power steering. How I did that can be found by clicking on the image.